Whydo we love Beijing?This essential question formed the focus of the 2014 Beijing Elementary andSecondary School Foreign Student Cultural Festival. Several hundred exchangestudents, hailing from many countries and attending schools throughout Beijing, participated inthis year’s performance, photography, and essay-writing competitions. These competitionsnot only allowed participants to showcase their creative abilities, but alsogave foreign students a chance to demonstrate their understanding of, andappreciation for, the city of Beijing.Althoughall participating students benefited from the chance to show their skills, severalBeijing No. 80 High School students also received more formal honors. There are30 students won the prize in this event. Three of them received highest honorsin the essay writing.competition. Finally, the “外国MEN”musical ensemble, which included several No. 80 students, earned first prize inthe performance divisionwith a spectacular song-and-dance medley.On the morning of October 30th,students from the three Chinese language classes travelled to Shichahai Sports School, in order both to recognizeprize-winners and to give all students the chance to participate in a“multicultural festival.” First, all students gathered in the auditorium toenjoy a wonderful program of student performances, which ranged from foreignelementary school students performingtraditional Chinese crosstalk to the dazzling dance skills of Beijing No. 80’s own 外国MEN.After the performances concluded,successful students in the photography andessay-writing divisions ascended the stage to claim their prizes and pose for acelebratory portrait. 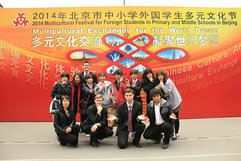 Students then moved onto a new array of activities,deepening their understanding of Chinese culture and society throughparticipation in the Shichahai Sports School-organized multicultural festival.A wide variety of artistic, athletic, and culinary activities contributed to theevent’s energy and richness. Similarly, student creativity and hard work, aprogram packed with brilliant performances, and the festival’s multiculturalfun combined to make this year’s Foreign Student Cultural Festival trulyunforgettable, and Beijing No. 80’sstudents eagerly await next year’s events!